The Louisville men’s soccer team upset No. 1 Notre Dame 1-0 at Lynn Stadium. Louisville (5-1-1, 2-0) remains unbeaten in conference play, while Notre Dame (5-1-0, 1-1 ACC) suffer their first loss of the season. Chances were not frequent in this ACC clash. The big game atmosphere affected the Cards early on. 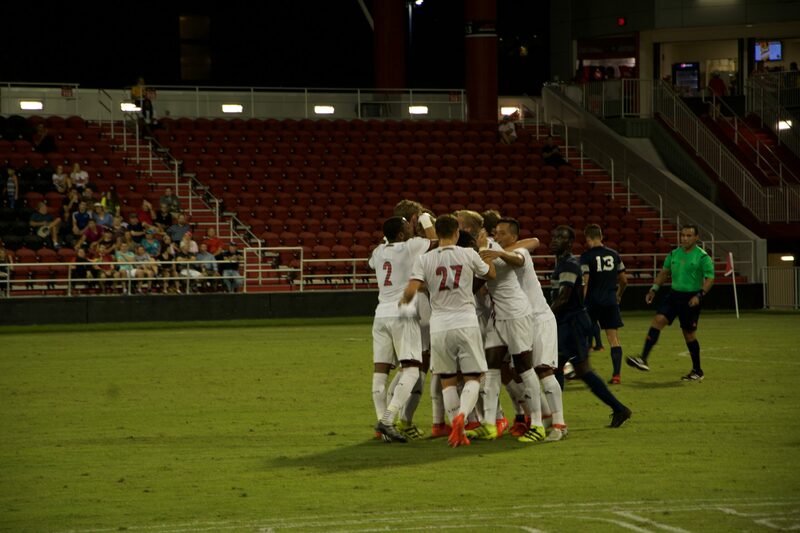 A bit of magic by forward Mohamed Thiaw gave Louisville the lead in the 25th minute. Joey Kunkel crossed the ball up the field to Thiaw, who turned a Notre Dame defender, spotted goalkeeper Chris Hubbard off his line and chipped a shot from 40 yards. Hubbard stretched in the attempt to save, but the ball fell just under the crossbar for Thiaw’s fourth goal of the season. Notre Dame pressured Louisville in the latter stages of the game, but the Cards stayed compact and made it difficult for the Irish attack that averaged just under three goals-a-game. Jon Gallagher almost equalized in the 85th minute, but Cleveland made a leaping save to his left to preserve the 1-0 lead. The victory was the Cards’ fifth, and third consecutive shutout. The Cards were outshot for the first time this season, 6-3, but limited the Irish to less than half of their season average of 16 shots. Notre Dame’s Jon Gallagher and Thomas Ueland led the way with three shots each. Thiaw led Louisville with two shots. The Cards travel to St. Louis to take on Saint Louis in their next match. Their next home game will be another ACC showdown against Virginia. Next How high can the Cardinals fly?